When a group only has three connected interior spaces for eyes, it is unsettled. The three-space eye on the left is a bent three, and the three-space eye on the right side is a straight three. 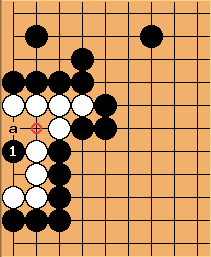 In both cases in the diagram, if White plays at the marked point she'll live. 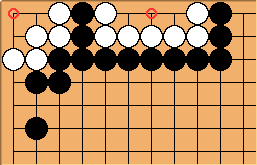 If Black plays there, White will die. If you can create a shape inside the eye space of your opponent which, after capture, leaves your opponent with a dead big eye, you will kill your opponent's group (see almost fill). 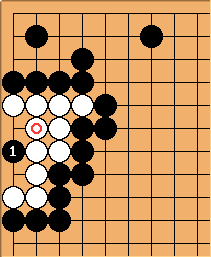 ...but capturing with doesn't help at all, because Black can respond with to keep the group dead. Here White is already dead. In general, a four-space big eye with two stones in it is dead, if they are in the centre. It does depend where the stones are. The presence of cutting points or other weaknesses can be used to reduce a four-space big eye to a three-space and hence dead shape. Black here can reduce the four-space big eye to a three space because White has a cutting point and finds herself in shortage of liberties. She would like to play at a to create an eye at the circled point, but that would put her in atari. The other option she has is to connect at the circled point, but that leaves a three-space big eye, which already has a black stone on the vital point. Obviously, White shouldn't even respond to . Her group is dead as it stands. Other and larger, perhaps seemingly live eye spaces can be reduced because of the presence of weaknesses. See Biggest Known Eye Space for which there is a Nakade for an example of such a (very) large eye space which at the end only gives one eye.